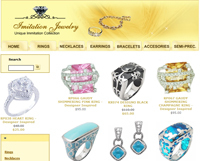 Unique Imitation Jewelry is a manufacture and wholesaler to public online store. Created on the outstanding workmanship of fine sterling silver jewelry anyone can afford. Jewelry is placed in a velvet pouch then in a box and will be beautifully wrapped (complimentary Gift packaging).